“Hey, what kind of sports car should I get?” I’m willing to bet nine times out of ten that the answer will be “Miata”. Do you want to learn how to drive stick? Get a Miata. Do you need a sports car that won’t break the bank driving or fixing it? Get a Miata. Do you need a sports car that is fuel efficient? Get a Miata. Do you want a sports car that you can have fun in without breaking the speed limit? Get a Miata. Do you want a sports car with a convertible top so you can blow your vape out of the cabin with reckless abandon? Get a Miata. The answer is always Miata! This is to be expected of course, as the first-generation Mazda MX-5 Miata (or the Eunos Roadster for the JDM crowd) is the classic car of the 21st century. That’s not hyperbole either; it is rare that a car with the Miata’s combination of affordability, reliability, and enjoyability even exists in today’s market. With all of the safety and fuel efficiency mandates for newer cars, it’s amazing that you can still get a genuine sports car with no ABS, Traction Control, “Nanny” Systems, or even Power Steering! As a result, the Miata is the go-to sports car for all levels of enthusiasts, and has a developed sizable cult following as well. In other words, the Mazda Miata is essentially the perfect, front-engined, rear-wheel-drive, convertible sports car for everyone. But what if there’s a way to manipulate this formula without having to sacrifice affordability, reliability, and fun? What if we can make the Miata mid-engined? 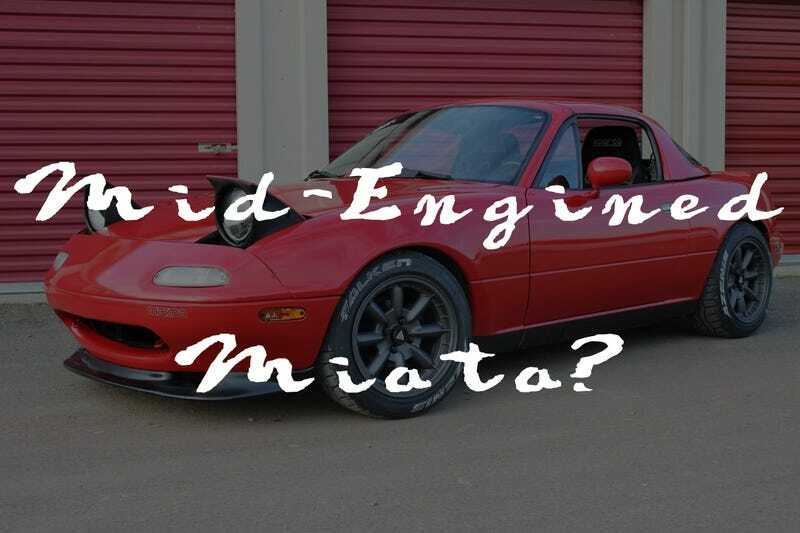 Before the purists start yelling and pull out their torches and pitchforks, let me start by saying this is just a theoretical exercise exploring how a Mid-Engined Miata might be achieved, and how the result may look when compared with the original. Also, it’s a lot of fun kicking the hornet’s nest a bit and making a few people upset. And now for some blasphemy! I stole this from Pinterest and I have no idea who it belongs to. Probably Enkei. So here we have the original, NA Mazda MX-5 Miata (in case you didn’t know, the “NA” designation refers to the first generation of Miata). This particular example features a tasteful assortment of modifications, including a lip spoiler, aftermarket rims, a hardtop, and some headlight decals that serve to make the car look more “aggressive”. Kind of like painting angry eyebrows on a kitten, really. No amount of makeup is going to make your kitten look mean, so stop trying. Here, you can see that Mazda had designed the NA to feature the proportions that define the look of a classic sports car: Long nose, short rear deck, low stance, and with the cabin placed farther back to accommodate the longer nose. It isn’t quite as exaggerated as with a Jaguar E-type as the Miata was more conservative with its design, however the it is still effective in communicating that it’s a sports car. The engineering of the car also drives its design. The NA has a Longitudinally-mounted (North-South) Inline 4 with a 5-Speed Transmission driving the rear wheels through a drive shaft-connected differential. This sort of setup is also found in most front-engined, rear-wheel drive cars. However, the most common engine layout would be a Transverse-Mounted (East-West) engine with a transaxle driving the front wheels. This is very important, as you can’t simply reverse the direction of the current engine without severely changing the proportions of the car. So the question is how would we go about changing the engine layout? An graphic showcasing the engine and transmission layouts for all generations of the MX-5 Miata. If the same engine and transmission were to be used, then we can simply reverse the direction of the transmission and then rotate the entire assembly 180 degrees, while drastically shortening and re-positioning the drive shaft. The result would be something similar to the Lamborghini Countach, which pioneered this particular configuration. However, this layout would push the cabin too far forward on the chassis, ruining the already attractive proportions (Lamborghini got around this by making the entire car wedge-shaped, hiding it’s size). Also, the engine itself would have to be positioned higher to make way for the driveshaft and the differential, making the center of gravity higher for the entire car. Lastly, the driveshaft would have to go through the engine itself, complicating the design a bit further. Obviously this type of layout will not work for our purposes. Instead, the answer lies in a traditional mid-engined format: Transverse-mounted, rear-wheel drive. The advantage of having a Transverse-mounted engine is that depending on the type of engine used, the resulting assembly is more compact and less complicated. An engine like this would utilize a Transaxle to drive the rear wheels, eliminating the need for a driveshaft. There have been several notable cars that used this engine layout as well, such as the Lamborghini Miura, Lancia Stratos, and the (actual mid-engined Miata) Toyota MR2. Essentially, this is the engine layout that is needed in order to keep the proportions and the styling of the Miata somewhat intact, with little cosmetic change. As an added bonus, the very same engine can be used with a transaxle from Mazda circa 1990, making the entire assembly doable with existing parts. WARNING: THE FOLLOWING IMAGE MAY NOT BE SUITABLE FOR SENSITIVE FANBOYS, AND MAY CAUSE YOUR FACE TO EXPLODE À LA RAIDERS OF THE LOST ARK. VIEWER DISCRETION IS ADVISED. Image Credit by yours truly. The cabin has been moved and placed slightly forward on the chassis, making more room for the transverse-mounted 1.6L Inline 4, 5-Speed transaxle, and fuel cell. The Rear Quarter panel has been lengthened to accommodate the new cabin position, and an air intake has been added in order to feed air into the radiator, which is now positioned at the rear of the vehicle. The nose has been shortened to make more space for the engine at the rear of the car. Also, the trunk space has been moved here. Obviously, there would have to be a few design details to address cooling the engine and expelling the hot air from the rear of the vehicle, but other than that, this is basically what a mid-engined Miata could look like. Eventually, the California Team’s design was selected and evolved into the beloved NA MX-5 Miata. Still, if Mazda had considered making an affordable mid-engined sports car to go against the likes of the Toyota MR2, then the little abomination this exercise produced might have actually been made as a sister car to the NA. If that were the case, perhaps we’d still have an affordable mid-engined sports car today, being wrapped around trees by Dude-bros in clouds of Vape vapors(?) with suspensions more crooked than a Walmart shopping cart. Every day, we drift further from God’s light. That’s not a pun, either. You can’t drift in a stanced car. One can only imagine the horrors possibilities.